This infographic from the report summarises the carnage and the resulting economic impact. In addition to highlighting the perils of the industrial food system, the document identifies five co-dependent leverage points for building healthier food systems. Among these are lines of action we can all champion. Reasserting scientific integrity and research as a public good. Bringing the alternatives to light. Building integrated food policies under participatory governance. This report follows on from their ground-breaking first report From Uniformity to Diversity: A Paradigm shift from industrial agriculture to diversified agroecological systems. The Northland Food Policy Council is asked political candidates from the Far North, Rodney, Te Tai Tokerau and Whangarei electorates five questions. Their responses are published here. Please pass this link on through your networks. Here are links to the candidates’ responses. Each electorate has its own webpage. 1: What do you think your role as an MP or potential MP is in our region’s food system? 2: Should NZ be protecting prime agricultural/horticultural land from urban sprawl? What’s your position on how best to do this? 3: The World Health Organisation recommends implementing a 20% tax on sugar-sweetened beverages as a measure of reducing childhood obesity. NZ has the third highest rate of childhood obesity in the OECD. Are you in favour of a tax on sugar-sweetened beverages? 4: Do you support Local Councils having the power through the Resource Management Act to declare Genetically Modified Organisms (GMO)/Genetic Engineering (GE) free growing zones in their regions? 5: How will you ensure that food system policy, such as the Food Act is scale-appropriate for small and medium scale farmers, growers and producers (e.g. on farm meat processing). Every project I’m involved with aspiring to move from an industrial food system to a sustainable food system reinforces the critical importance of connecting people. 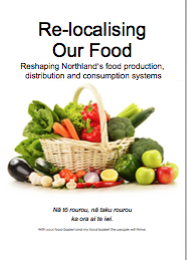 In Northland we have a lot of organisations aspiring to improve our food system. They range from environmental groups and landowners working to improve waterways, health workers, farmers and growers, marae-based groups, co-operatives, educationalists and researchers to name a few. The problem is, we are barely aware of what each other are doing. Collectively, I am sure that there are a lot of us. But we fail to leverage our collective voice. The development this year of the Northland Food Policy Network encourages me. Its a group of volunteers of similar diversity expressed above advocating to influence policy. Our success will be proportional to our ability to connect with others of like mind to generate momentum for change. The industrial food system has super-tanker momentum! It has slick and seductive marketing, economies of scale, sophisticated supply chains and political influence. And perhaps most insidiously, it is the normal – the orthodox, with mostly unquestioned legitimacy. This Guardian article identifies a similar dynamics for those advocating for climate change. Advocates for change are often left to work on individual efforts while the neo-liberal agenda actively seeks to shore up the status quo and feed our oil addiction. power over ( the power to effect and embed change). Those of us focussed on food system change have taken steps to make connections and are developing the capability for collective action. Our ability to influence will be determined by our ability to make ongoing connections. Another useful idea from this video is Duncan Green’s power analysis adapted below. Those with high concern about issues, but low influence have to find their collective voice, translate it into action and engage and influence those who have influence but are not engaged to change. We need to reach out to landowners and supermarkets for example. Follow this link for more on change, based on Duncan Green’s thinking. Two projects that Local Food Northland are working on are supporting the change dynamics. We are supporting the Northland Food Policy Network and Clive McKegg is leading a project to develop a database of individuals and organisations with common aspirations. We are fully aware that a data base is only part of the engagement equation. We need to engage kanohi ki te kanohi (face to face). If you want to see a food system that serves people by supporting our health, building our economy and sustaining our environment, one practical step is to help us connect with organisations that you are aware of that want these outcomes too. Please contact us or leave a comment below. Hot on the heels of the New Zealand Beverage Guidance Council released a policy brief on a sugary drink tax comes the University of Auckland’s Health Food Environment Policy Index. Professor Boyd Swinburn claims the Government lacks the political will to stand up to the food industry and push the necessary policies through. Professor Swinburn would like to see more community action to see this elevated in the governments perception from a problem to an urgent problem. Action on food quality in schools is a “no brainer” according to Professor Swinburn. Here is his Radio New Zealand interview. The New Zealand Beverage Guidance Council released a policy brief on a sugary drink tax. In New Zealand sugary drinks contribute to 26% of the sugar intake of children, exposing our children to a range non-communicable diseases including type 2 diabetes, cardiovascular disease, gout and dental caries. The policy brief also reports a link between a high sugary drink intake and cancer and impaired cognitive development. Fund a national roll-out of Healthy Families New Zealand. Note current cost is $10 million per year for a quarter of the NZ population. A further $30 million per year is needed to grow this initiative allowing national coverage. Ensure funds are used to support Sustainable Development Goals (SDGs) as identified by the United Nations. Kathryn Ryans interview of Professor James Walvin on the history of sugar emphasised its impact on history over the last five centuries. The majority of the millions of African slaves shipped across the Atlantic worked to produce sugar so Westerners could sweeten their drinks. The sugar story is also about the rise of activism to change public opinion as covered elsewhere on this website. In the late 1700s and early 1800s, courageous and visionary people advocated for the abolition of slavery. One of their weapons was a sugar boycott. We can emulate their spirit and conviction and give our children a better chance of growing up healthy. You can access Kathryn Ryan’s interview here. Eight countries, several U.S. jurisdictions and eight Island countries and territories have implemented taxes on sugary drinks (Wikipedia). In 2016 the WHO urged all countries to impose a tax recommending 20%. Yet our politicians and health authorities seem to be asleep at the wheel on this issue. Jamie Oliver sums it up nicely. And shame on the Auckland DHB for refusing to host the FIZZ conference at Auckland Hospital finding the issue too political! This sounds more like China heavying us about the Dalai Lama! Here is an example of the advice the Minister is getting from the Ministry of Health. This recent post reveals other dodgy policy stances from our government. The mantra used by our politicians is that the evidence is not there. Don’t believe the spin. Its trickling in now and will soon be a flood. Here are some examples. A WHO report, Fiscal Policies for Diet and the Prevention of Noncommunicable Diseases claims a 20% tax results in a drop in sales. The Guardian reports that Mexico’s sugar consumption has fallen for a second year running. Deakin University research finds that sugar taxes benefit low income groups, debunking a common criticism of sugar taxes. Here is a link to the FIZZ sugar research page. Meanwhile, the Obesity Update 2017 Report from the New England Journal of Medicine ranks New Zealand as third in the OECD for obesity rates at 30.7% behind the U.S. (38.2%) an Mexico (32.4%). Perhaps our politicians will wake up when we pass the Mexicans? There are calls for the tax revenue to go to the health system, but that may be counter-productive until health professionals display more food system awareness than is evident now. Targeting the impacts of childhood poverty may generate the best impacts. In Mexico some of the revenue is spent on ensuring all schools have clean water supplies. Ask your electoral candidates where they stand on a tax for sugary drinks.